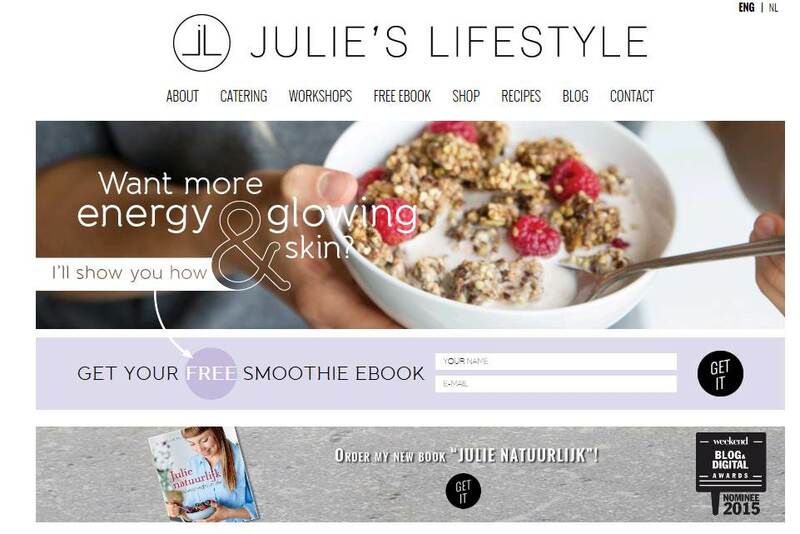 Our 70th “Follow them Friday” features Julie from Julie’s Lifestyle who blogs in English & Dutch. I started blogging during our raw food chef & instructor training at the Living Light Culinary Institute in California back in 2011. I wanted to share my experiences while traveling. 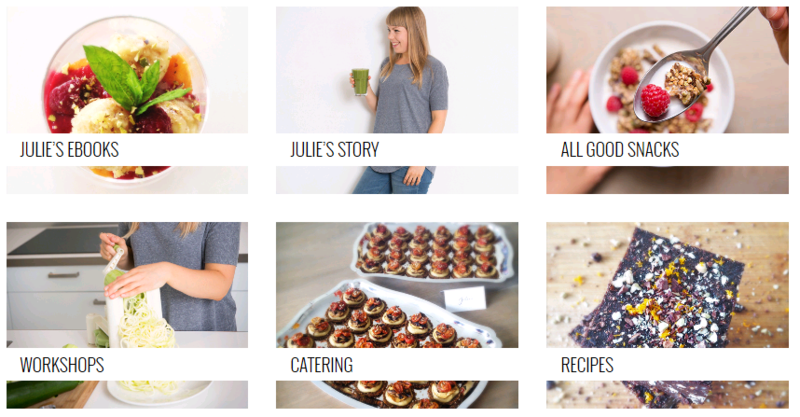 Julie’s Lifestyle quickly grew into an online platform where I now post weekly new recipes, and where we offer raw vegan culinary workshops, catering and books too. I love cooking for friends, family or Simon & I – but when I really want to relax I love eating out! Simon & I recently traveled to New York for the first time, and the raw & vegan food scene there was simply amazing. It seems like all we did, was walk and eat I love discovering new vegan/healthy food hot spots – plant-based food is my n°1 passion! I like to order several dishes on the menu to share. That way, I can try several dishes at once. Mexican Tacos – raw vegan style! It’s the most requested dish in our catering business, and we love sharing them with friends and family. I haven’t met anyone (yet) who could resist them. We first make raw vegan tortilla wraps in our dehydrator and then fill them with chili ‘sin’ carne, avocado, tomato coriander salsa, Romaine lettuce, carrot, avocado and sour cashew cream. At the moment: sweet potato fries with guacamole. Addictive! Sweet potatoes are my n°1 staple during wintertime. They help me to beat sugar cravings, keep my energy levels stable and they make a great post-workout recovery snack/meal. I’ve included my favorite recipe in my new book Julie Natuurlijk. Ice cream, without a doubt! Not traditional dairy ice cream of course, but banana ice cream. Want to try ice cream for breakfast with one single ingredient? Freeze a couple of peeled ripe bananas overnight (make sure they are brown and spotty! ), cut them into smaller pieces and throw them in your food processor the next morning. Instant healthy ice cream! For fun recipes, check out the dessert section in my new book Julie Natuurlijk. Raw vegan cheesecake was one of the first desserts I tried when I was introduced to raw food. I had been following a gluten, dairy & sugar free diet for years so I always had to skip dessert when we went to a restaurant or dinner party. When I discovered raw vegan desserts, I felt like a little child in a candy shop. So many possibilities! Cheesecake is still my favorite gourmet raw dessert. It is incredibly rich in flavor and nutrients. And the best part: you can enjoy it without feeling guilty afterwards. My partner Simon & I organize raw food workshops, we offer raw & vegan catering and we launched Belgium’s first homemade raw vegan product line called ALL GOOD earlier this year. Two months ago, I also published my first raw & vegan cookbook Julie Natuurlijk which is very exciting! When I’m not working, I love to exercise. Whether it’s a 20-minute HIIT workout in the morning, Pilates with Cassie Ho from POP Pilates, a 3km swim, or Yoga with Mandy Ingber’s Yogalosophy DVD (Jennifer Anniston’s yoga teacher), I love moving my body! When I work out in the morning, I’m more productive at work, I feel happier and I have better digestion. I also like to travel, spend time in nature (one of my favorite ways to unwind), discover new raw & vegan food hotspots, spend time with family and read.